Outside the USA? Click here to find a retailer in your country. A black foam wall pad is included with the mounting plate to prevent scratching or marring of the wall or item the hanger is mounted to. The sleek black stand-off provides just the right amount of clearance from the wall for angled or straight head-stocks while maintaining a low profile appearance. The rubberized swivel yoke cradles the neck of the instrument and adjusts automatically based on shape of the neck, head-stock and weight to create the perfect presentation and keep the instrument straight. Gator Frameworks is dedicated to producing the highest quality stands and accessories. We back up that commitment with a 3 year Warranty on any manufacturing defects in material and workmanship. This warranty applies to the original owner and requires proof of purchase. Our warranty entitles the original owner repair or replacement of the product, or replacement with a comparable product of similar value and condition at our discretion. 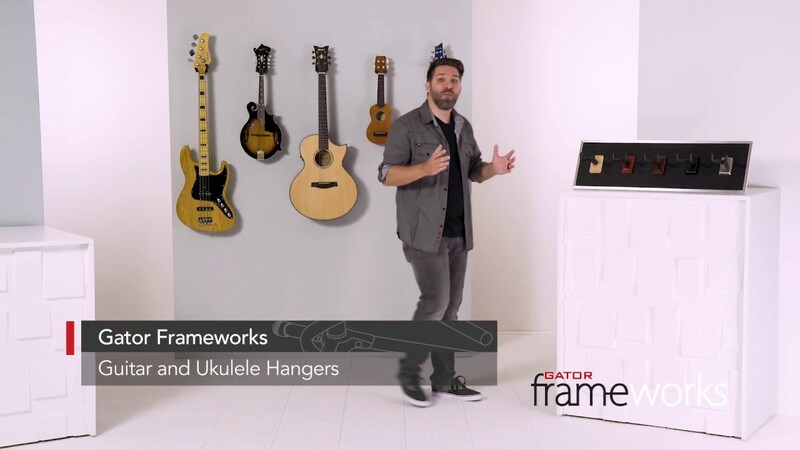 This warranty is limited to Gator Frameworks products only and excludes loss of personal property, loss of use, accidental damage, misuse, or normal wear and tear.This warranty is not applicable to Rok-It products. Gator Frameworks is dedicated to producing the highest quality stands and accessories. We back up that commitment with a 3 year Warranty on any manufacturing defects in material and workmanship. This warranty applies to the original owner and requires proof of purchase. Our warranty entitles the original owner repair or replacement of the product, or replacement with a comparable product of similar value and condition at our discretion. This warranty is limited to Gator Frameworks products only and excludes loss of personal property, loss of use, accidental damage, misuse, or normal wear and tear. Damage not Covered – The Gator Cases warranty coverage is limited to manufacturing defects and does not cover any damage caused by misuse, neglect, accidents, abrasion, exposure to extreme temperatures, solvents, acids, water, normal wear and tear or transport damage. Moving Parts – The Gator Cases warranty covers moving parts that are subject to regular wear and tear, including but not limited to zippers, retractable handles, and wheels, for one year from the point of purchase. After one year we will continue to offer field replaceable parts at no charge for the lifetime of the product. However, replacement will not be available after one year and repair services will be at a charge. Electronics – Gator offers a ninety-day manufacturer’s warranty on all electronics. After ninety days please contact Gator Cases for more information on purchasing replacement parts. Airline/Shipping Damage – The Gator Cases warranty does not cover damage caused by airline or freight company mishandling. Should the airlines or another carrier damage your product, a claim should immediately be filed with the carrier. Most carriers offer insurance against loss or damage. We are happy to assist you file your claim by providing cost information on parts, repair, and replacement. Discontinued Items – Gator Cases warranty supports parts and replacement of discontinued products for one year from the point that the product is no longer commercially available from Gator or from one year from the original purchase, which ever date is later. After one year the product is out of its life cycle and no longer warrantied, however if we still have the part or a substitute part we are always happy to accommodate our customers with a part replacement. Please contact us to find out about availability on a per case basis. • Any improper or incorrectly performed maintenance or repairs are performed by a Non-Gator-Approved service center. • Any Gator Cases products are used in a rental capacity. Outside the USA – Please contact us to receive information on your local distributor. We protect your privacy like we protect your gear. We will not share or sell your data to thrid-party advertisers - so sign up worry free!